Engaging with Advantech Software, there are a set of phases that we follow to ensure you receive a successful outcome. The same software development process is followed regardless of how big or small a project it. It also applies to any software development solutions, be it a website, custom software development solution, cloud or mobile app development project. We highly recommend a face to face meeting at your premises. This gives us the opportunity to see how you operate your business and perform the daily duties. Every business is different and this gives us an idea of what you need to achieve routinely. The onsite visit can also help us identify other areas of your business that we can propose as areas to automate to help save you money. After the onsite visit and various communications with your business, we can provide you with a detailed quotation for your software project. Time & Materials is a method where we will issue fortnightly or monthly timesheets of time spent on a project for payment. You only pay for the time spent by our staff. The timesheet reports are very detailed, that clearly identify each module that was worked on and any other tasks that were included in the time. Time & Materials is invoiced monthly. This can help with your cash flow instead of having to pay upfront for a portion of the project. Fixed Price offers security in a fixed price for the project as a whole for all items that were listed in the quotation. Fixed Price offers a split scheduled pricing model, based on identifiable deliverables for the project. Any major variations to the quotation that fall outside of the original scope need to be quoted separately. Discount can be offered for fixed price projects upfront. Upon acceptance of a quotation, a software development agreement is signed by both parties and an agreed start date and estimated end date is proposed. Before starting any project, a schedule is drawn that allows you the customer to see where progress will be at any given time. The schedule also helps identify the deliverable points within the project, when reviews will be conducted. For most projects, we provide a test portal where you the customer can login and see the progress of the system and provide us with feedback from as early as week 1. The constant feedback throughout the development of a project is vital as this allows us to make the changes as we go rather than a long list of changes to make at the end. It also gives us the opportunity to make the small changes along the way without raising variations, where possible. A regular face to face review is recommended, providing your availability where we will review the system together. 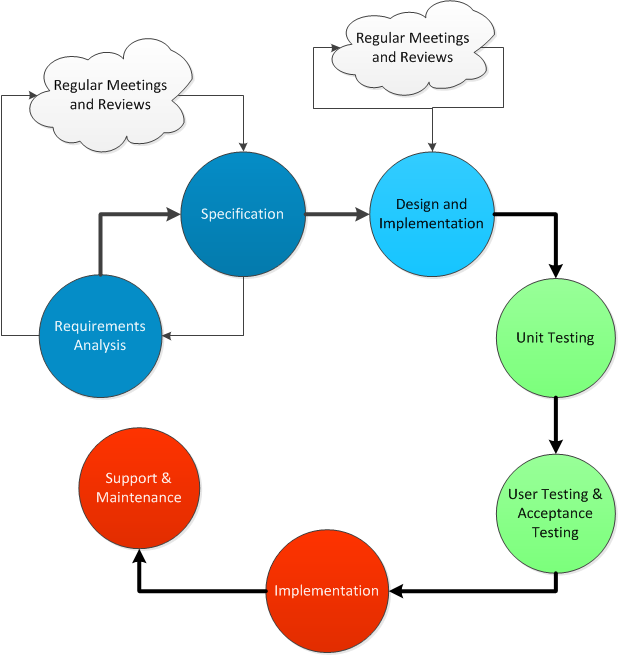 Once a project goes into Acceptance Test phase, you have a nominated amount of time to review the system as a whole and run your acceptance test plans. We can offer our assistance to draw up a comprehensive acceptance test plan should you wish. As part of all our projects, training is included to help use the new system. We can offer this training before or after go live. Once you have accepted the system, a date to go live is decided upon. Should any data conversion operations be necessary, a test run will occur before go live to ensure the data ports across correctly. Assistance on the day of go live is always offered and we can also be onsite for the first day or 2 of operation to assistance the users with the new system. We make the process simple and easy for you and ensure a successful business outcome for your business!